A new take on battery technology could mean that we’ll soon be able to charge our device batteries twice as fast as what’s possible today. Engineers at the University of California, San Diego have developed a new charging algorithm that slashes recharge times in half and helps them run more efficiently. Most research in the battery field as of late has centered on how to make existing lithium-ion batteries smaller and thinner so they can better fit into portable devices like smartphones, tablets and notebooks. Capacity is still very important but we haven’t heard much in the way of faster and more efficient charging technologies until now. Researchers point out that manufacturers rely on voltage and current to monitor a battery’s behavior and health – metrics that are described as very crude. In layman’s terms, it’s like trying to have the ticket collector at a movie theater estimate which seats the customers are taking by monitoring the speed of the entrance line. 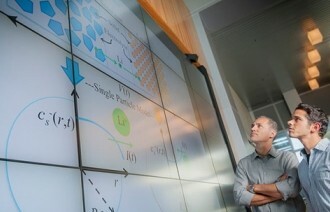 The new algorithms allow researchers to estimate where the lithium ion particles are inside the battery. Using the movie theater example, they will now be able to fill the theater to capacity safely and more efficiently. Engineers are sharing a $9.6 million grant from the Department of Energy with automotive products supplier Bosch and battery manufacturer Cobasys to further develop and test the algorithms in electric vehicle batteries. The team estimates the breakthrough has the potential to reduce cost by up to 25 percent. More importantly, however, is the fact that this technology will be going into products that people actually use.